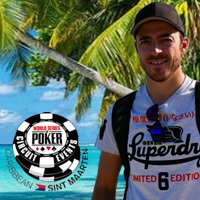 ScubaSt3ve recently won an online tournament series and this week he’s playing aboard the Oasis of the Seas cruise ship, sailing from Florida to St. Thomas, St. Maarten and The Bahamas and playing in the $1100 buy-in Caribbean Poker Tour Main Event. ScubaSt3ve said his tournament strategy is to be really observant, play tight until he can read his opponent, then be really aggressive when it looks like players will fold. 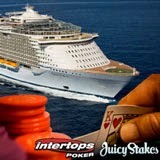 “To win the Caribbean Poker Tour tournament at Intertops I was really aggressive. I got out to a big chip lead and from there I was able to put players in tough situations for their tournament lives. " “Towards the end there were three players left and they were shortstacked with only a couple of big blinds remaining in their stacks. I didn't know how loose to open and think I might have folded a couple hands that were strong enough to raise." “I didn’t realize I might win until I reached the final table. There were about 7 people left and I was in the top half. It wasn't the toughest field ever but there were certainly a couple of really tough players. I thought hmm I could do this. I have a 1 in 7 chance not bad. And then 1/6 and so on!!" “I opened really loose with Jack 3 off suit. The flop was A93 and a player from the small blind led into me. It didn't make sense to me because I assumed that he would re-raise all of his big aces preflop. So I called. The turn came a Jack and gave me two pair. He bet big again and I had a decision to either call or raise and get all the money in right there. Since I thought he was likely bluffing I just called the turn. The river was another 3 and gave me a fullhouse. He went all in on the river for a big bet and I called immediately. He had JQ and was bluffing the whole time. So my decision to call the turn and allow him to bluff the river netted me a huge bet on the river. If I had raised the turn he would have just folded." “I was in first place at the time and he was in second place. So after that hand I had a huge chip lead and the tournament was essentially mine." “I pretty much only play online now because I think it is a lot more fun. It is much faster so you don't have to be as patient. But my live game has definitely improved as I have been able to play thousands of poker hands online so my understanding of general poker spots is much more in depth." “My goal is to one day play the highest stakes and battle the best players in the world. I don't really play live but my near future goal is to try to win this Main Event in the Caribbean. I plan playing more live poker in the next month trying to prepare for this tournament."